Field Hockey, although very different than ice hockey, is a sport usually overlooked because of its similarity to its much “cooler” cousin. Ice hockey is a very competitive game watched and played by many people in northern states where the weather is colder during the winter. That being said, field hockey is more of a summer sport associated with fans baking in the late summer heat. Why is it that field hockey is so often overlooked by many people? Is it because of the miserable temperatures that you have to endure as a fan or player, or just because of complicated rules? 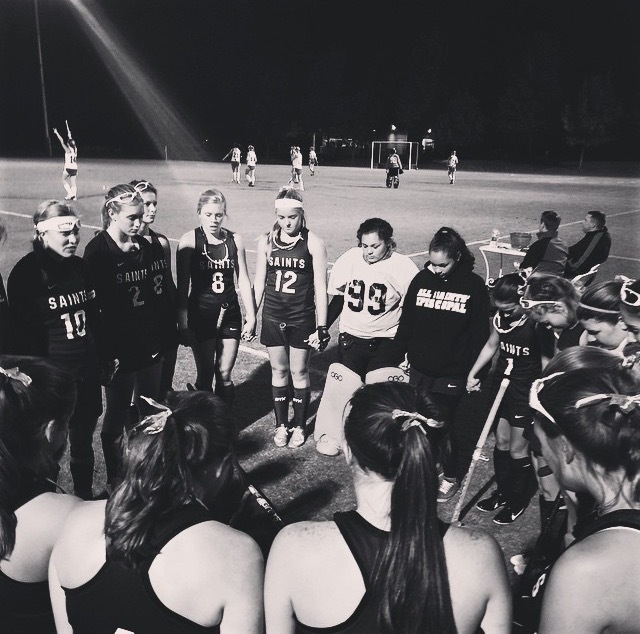 I attended an All Saints’ varsity field hockey game to see what field hockey is all about. All Saints’ varsity field hockey played the Oakridge Owls this past Thursday evening, October 8, 2015. The Saints pushed through this difficult game by keeping the score tied 0-0 throughout the entire regulation play. Once the seven minutes of overtime were up, the score was still tied at 0-0. Both teams lined up in the middle of the field for a best-of-five shootout. In field hockey, a shootout is when both teams take turns sending one of their players up against the opposing team’s goalie. They have the chance to score a goal and whichever team has the best score out of five wins. Anticipation filled the air as fans watched quietly. All Saints’ makes their first two goals, but slip up on their third; Oakridge, on the other hand, missed their first goal but had a come back and won the game. If it weren’t for the players, there wouldn’t be a team, so I spoke to a few of the All Saints’ players and asked them their opinion on playing field hockey. All Saints’ Junior, Corynne Hammit, played outside defender against the Lady Owls. First up for the Shootout, Hammit made the first goal. She went up again and made her second goal. Hammit not only plays field hockey at All Saints’, but she also plays select field hockey at Texas Pride Field Hockey Club. Senior Abby Carroll, is the goalie for the Lady Saints. Like Hammit, Carroll is considering playing field hockey in college as well. Seventh grade was when Carroll found her passion for playing field hockey, and by doing so, she also found some of her best friends. “I stopped playing select soccer, so that I could focus on field hockey; although I loved playing soccer I knew that I wanted to pursue field hockey further,” said Carroll. .Although All Saints’ lost against Oakridge, they did not make it easy for the Lady Owls. They fought a good fight all the way to the end of the game.